A little less than a thousand years ago, groups of Native Americans gathered near the Mississippi River in present-day Illinois to build a settlement of unprecedented size. “It’s an unusual phenomenon — a city in the middle of a continent without cities,” says Tim Pauketat, an archaeologist at the University of Illinois who has spent years studying the site, which was named in modern times for the unrelated Cahokia Indian tribe. According to the latest archaeological findings, Cahokia had three main precincts in an area of around 20 square kilometers, and at its peak was home to as many as 20,000 people. The countryside around the urban center was also heavily populated, with around 40,000 living within 40 kilometers of the city. The most obvious and lasting signs of the Cahokia’s civilization are the remains of more than 200 earthen mounds that served as platforms for many of the city’s buildings. Those sorts of questions have driven Pauketat and his collaborator Susan Alt of Indiana University to focus on understanding more about the history and purpose of the Emerald site in relation to the larger metropolis. “We now know that this strange little site had a few early shrines on it — it was there before Cahokia was a city,” Pauketat says. Digs at the Emerald mound have uncovered the foundations of shrine houses, which were likely constructed of wood and thatch with yellow plastered floors. For years archaeologists had known that the Emerald site was laid out in alignment with lunar cycles, but Pauketat and Alt’s team made an additional discovery: using a highly accurate form of radiocarbon dating, they discovered that activity at the site increased in line with 9.3-year and 18.6-year cycles when the moon reaches extreme maximum and minimum positions on the horizon. “We have really good evidence of these pulses of ritual activity,” Pauketat says. For those rituals, Cahokians likely traveled in processions from the main city and built hundreds of temporary houses surrounding the central shrine. “And then when the events were over, they would leave again,” he says. Pauketat believes that a desire for access to the Emerald site and other aligned ritual centers spurred the beginning of Cahokian urbanism. “The city seems to have its origin in a religious movement of some extraordinary scale,” he says. Cahokia grew because of the Emerald mound’s importance, and following Cahokia’s leap into urbanism, the Emerald site was reconditioned. “They leveled it, added earth to the sides, perfected the lunar alignment, and put twelve more flat-top mounds on top of it,” Pauketat explains. 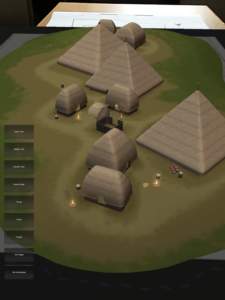 To help both archaeologists and the broader public gain a better sense of what the Emerald site was like at different stages in his history, Pauketat and Alt have been working with a colleague at the University of Illinois, computer visualization expert Alan Craig, to develop an augmented reality re-creation of the site. In the software’s current form, users can point their phones or tablets at a survey map of the site to see overlaid renderings of the structures that stood there. “We can start to evaluate space differently by putting the roofs back on these buildings that we only usually have in two dimensions,” Pauketat says. “It’s also fantastic for outreach — people can finally understand what we’re describing when we talk about Cahokian urbanism.” Future versions of the software will allow users to stand at the site of the shrines and see the models rendered at full size through an augmented reality application. Although Cahokia’s growth and decline is a comparatively recent phenomenon, contemporaneous with the European middle ages, Pauketat sees parallels with the development of urban and religious sites much earlier in human history, both in the Americas and at sites like Çatalhöyük in Turkey. Newly uncovered sites in North America suggest that Cahokia’s religious fervor may have inspired the creation of colony sites elsewhere in the Mississippi Valley — Cahokia’s designers may have used the colonies to increase the reputation of their central metropolis. “That’s why we see colonies with early cities in other parts of the world,” Pauketat says. “In Mesopotamia archaeologists view colonies as a mercantile phenomenon — that may be true, but there may also be a religious dimension.” Five thousand years ago, the ancient Chinese city of Liangzhu seems strikingly familiar to Pauketat — he terms it a “Chinese Cahokia” with an urban center surrounded by outlying shrine complexes. Recently a busload of elders from the Osage tribe — one of several present-day American Indian groups thought to descend from the Mississippian mound-building civilizations — traveled to the Emerald site at Alt and Pauketat’s invitation. There, he told them about his own theories of the Emerald mound’s history. “They didn’t know so much about the lunar cycles — they don’t follow that anymore — but the elders definitely thought it was consistent with their ceremonial sites today, which are always remote, off at the edge,” he says. Learn more about Tim Pauketat and his colleagues’ research on Cahokia from the University of Illinois project site. Watch the PBS series Native America, premiering later this month, which will feature visualizations of Cahokia and interviews with Pauketat. Pre-order New Materialisms, Ancient Urbanisms, edited by Pauketat and Susan Alt, to be published by Routledge later this year.